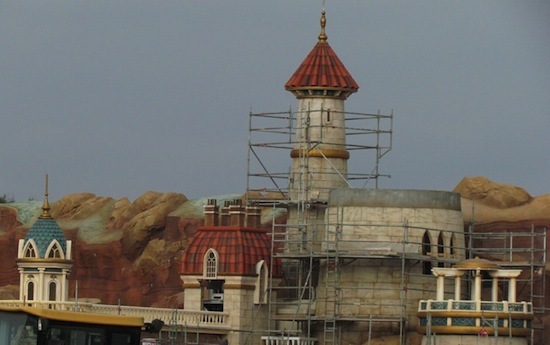 Vertical construction continues at New Fantasyland, where Dumbo’s structures are now painted, and the queue building circus tent is fully in place. Themed and painted elements are appearing outside the Little Mermaid ride, and a new wall near the restrooms by Pinocchio Village Haus gives a hint of the quality theming awaiting us when the land is done. More tree-clearing has occurred on Skyway Hill, in preparation for the new route (still months away) into Liberty Square from Fantasyland.